A plaque recognises the River Murray Barrages as a National Engineering Landmark. The barrages were designed and constructed by the Engineering and Water Supply Department of South Australia between 1935 and 1940, and funded by the Governments of the Commonwealth of Australia and the states of New South Wales , Victoria and South Australia under the River Murray Waters Agreement. Their type and scale are unique in Australia. They maintain fresh water in Lakes Alexandrina and Albert and stabilise water levels to allow irrigation of adjacent and upstream lands, whilst river floods pass through the concrete sluice and gate sections. 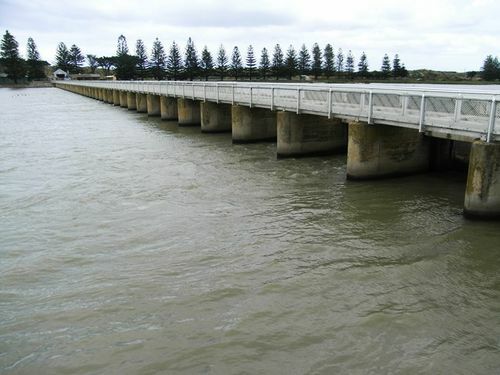 A lock in the Goolwa barrage permits the passage of large vessels and a lock in the Tauwitchere Island barrage caters for small boats. Without the barrages, the growth of Adelaide and the supply of water from the lower river to the lower South-East of the state would not have been feasible.